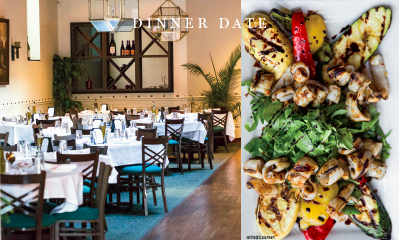 Gusto Italiano brings 30 years of experience making delicious Italian cuisine to Wilmette. Though the remodel is only a couple months old, walking into Gusto Italiano feels like walking into a classic, comfortable steakhouse, all dark wood and white tablecloths. A large tufted leather bar runs along the north wall. Vintage photography displays a Wilmette of the past in frames along the walls. A warm evening atmosphere is propagated by a variety of hanging light fixtures, all with subtle lantern qualities. After drink orders were placed, a breadbasket arrived containing two types of house bread, neither of which should be ignored: on top, warm slices of an Italian loaf, crisp crust with a hint of sourdough flavor; lining the bottom of the basket, a row of garlic rolls with warm doughy centers. In the grand Italian tradition, there are a bottle of olive oil and fresh grated Parmesan available for dipping. Our tour of the menu began with the lauded Grilled Calamari from the Antipasti section. Unlike the breaded and fried version of calamari, this appetizer arrives in a tangle of grill mark emblazoned squid with julienned red and green peppers, zucchini, squash, a handful of arugula, and a wedge of lemon. Here, the smokiness of the grill is the top note and the fresh calamari accepts the flavors of each side in turn, a touch of sour from the arugula, a zing from the peppers, and a lovely acid note from the lemon. Instead of burying the flavor underneath breading, this is a delightful marriage of textures and flavors. Arugula also played an important part in the Roasted Yellow and Red Beets salad that arrived as our next course. Slices of beets in an apple cider vinaigrette dressing, with cubes of feta, segments of orange, and a bushel of arugula charmingly drizzled with balsamic vinegar across the top. There’s a mild candy sweetness to the combination of the vinaigrette, feta, and orange. 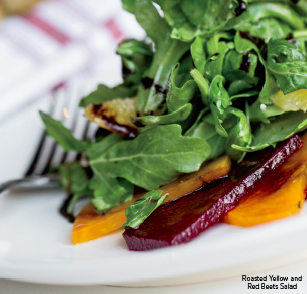 When combined with the bite of arugula and the earthy presence of the beets, it’s a dance of flavors at the opposite ends of the spectrum for a light and satisfying salad. The Veal Piccata is sautéed exquisitely tender, sliced thin, with a lighter presentation than steak, but brimming with succulent beef flavor. It’s also a beautiful conduit for a zesty lemon, butter, and white wine sauce drizzled over the top and a healthy helping of capers. A side of linguine in herb butter is the usual pasta punctuation for the dish, reveling in the distinct heartiness of the meat and pasta against the creaminess of the sauces. Rich and delicious. Italian sausage with the perfect touch of spiciness against green peppers and red onions. Fresh tomatoes provide the traditional marinara tone, enhanced, in this case, with a garlic and oil sauce. It’s a signature of the entrees at Gusto to bring a bevy of complementary flavors and textures to each forkful. Given the pleasant atmosphere of the tables surrounding us on a busy Tuesday night, it seems to be a common experience of dining here. We also heard the story of a table across the room where dined three young boys all under 10 years old and their parents. Apparently, if the three boys do well in school the previous week, they get to go to Gusto Italiano on Tuesday nights and get their usual table as a family. And no kids’ menu for these boys. At least one of them ordered the salmon. For dessert we had the sumptuous Panna Cotta: sweetened cream, thickened and molded into a gelatin texture, for an impossibly light and creamy dessert. Gusto places the main attraction over a drizzle of raspberry sauce and tops it with a sprig of mint and slices of peach and strawberry. The plating is lovely, but it’s not simply for show. The fruitiness of the sauce and the delicate flavor of the fruit combine for the freshest, brightest peaches and cream dessert you’ll ever have. Italiano has already cracked the code. Gusto Italiano is located at 1146 Wilmette Avenue in Wilmette, 224-408-2057, gustorestaurant.com.